← Stagger Plant heights when Planting (Designing) a garden. Equal Balance is an Ideal. Interior decorating is a lot like a two-sided scale. When you have a two-sided scale, your objective is to have equal balance on both sides. Look at the first drawing in the illustration for this post. On one side of the scale you have a ONE POUND block of chocolate. On the other side, to counterbalance it, you must come up with another one pound measurement. You could counterbalance the one pound block of chocolate with another one pound block of chocolate. You could also counterbalance the one pound block with a One Half Pound block of chocolate and one half pound of chocolate chips. Another counterbalancing option could be one pound of chocolate chips. It does not matter how you do it, as long as you have equal balance on both sides. If you can understand this concept, a lot of what interior decorating is all about will come easy to you. Now let’s take the concept of equal balance using chocolate, and relate it to interior decorating. In interior decorating, there is a north to south, and east to west equal balance. What you do, or build on one side of the room, you have to, counterbalance, make up its equal weight on the opposite wall. Now look at the second drawing in the illustration. In this drawing you have a fireplace with a picture hung over its mantle. The fireplace is also flanked by a pair of chairs, with floor lamps behind them. Measure the space from the floor up to the top edge of the picture frame hung over the fireplace, pretend the measurement is 85 inches. Then measure the space from the outside edge of one chair to the outside edge of the other chair that flanks the fireplace, pretend that measurement is 132 inches, or 11 feet. Your objective NEXT is to make an arrangement of furniture and art objects on the wall opposite the fireplace, that is also about, or exactly 85 inches tall, and 132 inches wide. The 85 inches is now the measurement from the floor that the sofa sits on, to the top edge of the frame of the picture hung over it. The 132 inches (11 running feet) is the space two end tables and sofa take up. That is equal balance brought from one side of the room to the other. It is your one pound block of chocolate, counterbalanced by a half pound block of chocolate and one half pound of chocolate chips. 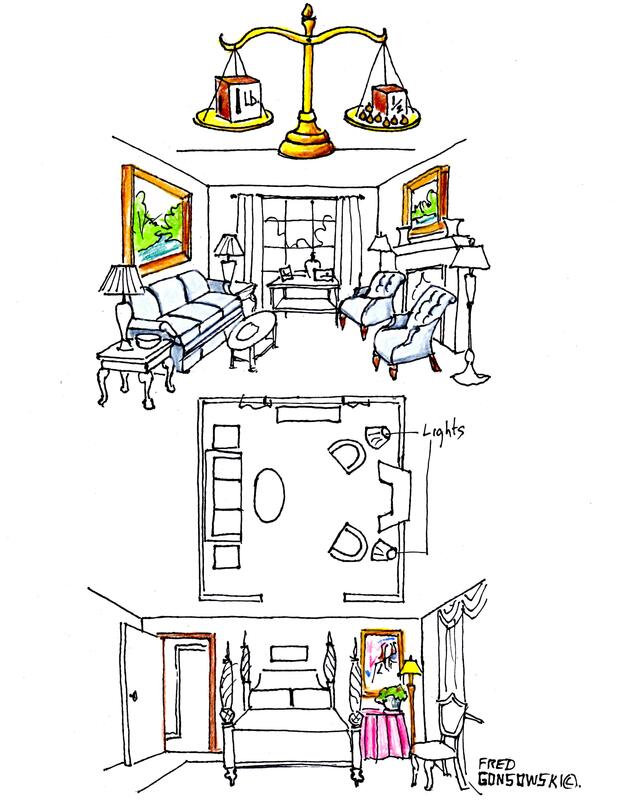 The third drawing is a floor plan for the room just described. In this floor plan also notice that the table and draped window, is counterbalanced by the archway, through which you enter the room. Remember me saying… north to south, and east to west decorating (balance)? Finally look at the fourth drawing. This is all about building visual weight all on one wall. In this room, you have a door on the left, that if measured from the outside edges of the molding that surrounds it is 35 inches wide and 83 inches tall, a bed placed in the center of the wall, and on the right a skirted table with picture hung over it, and a floor lamp. What you are doing here is making an arrangement of objects on the right side of the room that is the same height and width as the door on the left. I want you to know, the number one problem most people have is that they have unequal balance. They have really heavy on one side and way too light on the other. Remember Equal Balance is an Ideal! Finally start looking through decorating magazines. Look at the heights of arrangements of furniture and art objects on one side of the room and see how they are counterbalances on the other. At first you will have to look for it a bit. After a while you will be looking at the balance of the room, and then the decorating itself. Happy Examining! I have not visited your site in a while. What a wonderful job you have done! Very useful information, and I love the drawings! Glad to know that my initial attempts at decorating our new house are right in line with your thoughts and hints. I guess I have been a good student of yours over the past few years! Thank You Lori for your comment. I get encouraged when people type me a note, saying they like what I have done. My premiss, here at FGGH is to give people Easy to understand information (like I want to get myself). Hopefully after a person reads one of my posts, they will say to themselves “I CAN DO THAT”! What wonderful information you share. I am learning how to decorate a room, step by step. Thank you so much for freely sharing your knowledge. Your site, is by far, the best I have ever read. My left handed right brained learning style, does not understand traditional sites. We have spent much money on decorators. It never felt correct to me. When, I tried, I did it hundreds of times before it felt correct to me. Reading your site, not only explains it. But, saves me from not sleeping nights and rearranging objects and driving my husband crazy. I can not be more thrilled in decor advice, than I am this day. Thank you from the bottom if my heart. No, THANK YOU Kathy for just being soo nice to make a comment like you did. When I started this blog, my aim was to empower my readers, not really entertain them. I try to cover things, like I want to read things myself Really Simply. When it comes to interior decorating, gardening, and other things, if it is written simply there is more of a chance things will be able to get done. If you have not already, look at Interior Decorating Principles, under Categories on the right side of this site. All of my other decorating articles are located there. Thank you so much for this website. My mother had great design instincts but could not articulate design principles. My father was an engineer who could explain anything with a diagram but only for practicality. All my life I have struggled to bridge these two perspectives. Your website does it brilliantly! Your illustrations clearly explain design principles in a way that inspires the reader to apply their imagination in a practical way. Thank you! Hi there Stacy, thank you for your comment. I’m glad my topics have inspired you. Interior decorating and gardening is a individualistic thing so I hope each reader of my topics can take something from them, and apply it to their own situation. Thank you for posting this!! I have been scouring the internet for MONTHS for interior decorating principles that I can actually understand and apply, and this is the first article that has actually been helpful! As a first-time home owner decorating my house from scratch, it has been so frustrating because all my rooms feel a little bit “off”. (And it doesn’t help that I’m a left-brained accountant–not a single creative bone in my body!) Now that you’ve taught me the concept of balance, I feel a little more confident. Hi there Rachel, Glad you found my blog and my post was helpful to you. Look at all the different decorating articles that I’ve written, they are under Categories on the right side of the screen. All the decorating articles are under Interior Decorating Principles. Maybe after looking at the titles of the articles, other topics of interest will be explained there. Reading your blog has opended my mind and eyes for the decoration of my room. I am having sleepless nights thinking about how to do and what to do. Thanks a lot for this wonderful information. Just a query… In my living room all the walls are high but opposite to my fireplace is the open dining area.. now should I get a mirror equal to the ht of the bars in the dining space or equal to the painting on the adjacent wall. The plant and painting and the lamp on the same side need to be equal in ht for vertical tension or can break like I keep an arc lamp. Thanks Fred…Can I pls send you the pics… Few details to help you visualize.. The walls are 150″ high no moldings just bare walls no lights in ceiling . They are L shaed. The living room has stairs to take you up to dining space which is open and looks down at the seating area. Now the wall for painting is continuing to dining space. It is split level. Can I put ceiling high curtains and a mirror 40″high.. so the total vertical ht of fire place will be…(45″ fireplace +40″= 85″ ) so the mirror will be a bit high then the opp vertical ht. Will it be imbalance.. I loved reading your very helpful articles which clearly explain the complex art of decorating. It is an art and it doesn’t come easily for most. One area I would like to see explained is how to mix wood furniture in an open plan room. This is no easy feat for the untrained eye. Any chance you would think about it? Hi there Julie, I’m busy with the garden at this point, but I’ve been thinking about writing an article about mixing different styles of legs on furniture in a room. To it, I will add working colors of different kinds of wood throughout a home with an open floor plan. Thanks for your comment. Fantastic! I can’t wait to read your pearls of wisdom!! I personally am in dire need. Julie, right now think about working the different colors of wood in many parts of your home. If a certain color of wood is only in one place, the eye looks at it and stays there. If you have the different colors of woods in many places, the eye keeps moves from one spot of that color in the room to the next. Read my post titled Pick (Use) Four colors when Decorating a Room, there is a similarity to wood as there is paint and fabric. Also read Color Theory..When interior decorating a room, Remember Wood is a color too. Hope those two posts will inspire you for now, until I come up with a real post on the topic. Thanks for your comment, Happy Spring to you! Thanks for your helpful comment. I have already read the two articles but am still somewhat perplexed. The problem is, I have three rooms in one large open space and I am finding it difficult to get the balance right. I just happened upon your site when trying to design a gallery of pictures. That article finally made me understand what was wrong with the collection of pictures on my mantle (the collection was taller than wider while the wall space is wider than taller!) I never heard this explanation and it has changed my whole approach on creating wall galleries. This article about balancing a room is so helpful as well. I have a narrow room with two walls (one long wall with a sofa and two windows, and an adjacent short wall with a fireplace). The wall opposite the sofa wall is a mostly a staircase with an open banister and very little wall space under it. I am wondering what to do with the staircase wall to create the proper balance, Thanks for your wonderful articles! Hi fred, thank you for sharing your wonderful advice. My boyfriend and I have been living together for a few years now but haven’t paid much attention to our apartment until now. Im curious how this balance rule applies to rooms with irregular layouts? For example our kitchen counter is set at a diagonal and juts out into our living space. We have 4 walls and then the hallway and counter area. None of the walls are the same length. Hi there Elizabeth, read my post Hanging Pictures Around a Room, lining things up with other things is also a part of balance. There might be something in that article that might inspire you in some way. Good luck with your project. You speak of balance. I have the 20×20 living room with a corner fireplace & a built in entertainment area & a floor to ceiling built in bookcase. All on the outside wall. The opposite wall has a centered arch to the dining room. Should I have something big & tall on one of these walls for balance? ?